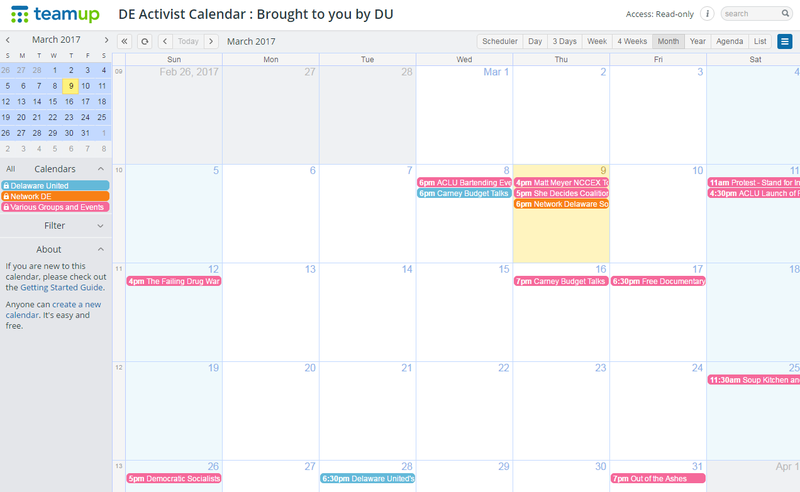 By popular demand, Delaware United is proud to introduce the Delaware Activist Calendar! This is a searchable, shareable group calendar, powered by Teamup. It can be shared far and wide to cover all the various progressive Delaware groups’ activities–informing the public, across all groups, about exciting events up and down our state. We invite all progressive groups to join this calendar! Currently, we hold six remaining administrative access codes, but we will possibly be gaining more in the future if needed. We’d like to offer those codes to the most active groups sponsoring one or more weekly events, but are happy to post events from all groups. So, if you don’t hold weekly, or bi-weekly events, but want your events to show up on the calendar, please send us an email with the basic information in it (you can use this template or send us a FB events link). An amazing thing about this particular program is that any group can share this calendar on their Facebook page. (You can see what that looks like on the left side bar of Delaware United’s Facebook page, under “DE Activist Calendar.”). You can even embed the calendar on your group’s webpage. (You can see what that looks like on the homepage of www.DelawareUnited.org). All involved groups will have access to the calendar, and it will be the same calendar for everyone. At last, every groups’ activities will be in one calendar, and that one calendar can be shared identically in multiple places. The groups that hold the most events, like Network Delaware, UUDAN, and other large organizations, can post their own events whenever they want! Smaller groups with fewer meetings can contact Delaware United via email or FB (again you can use this template or send us a FB events link) to have events posted for them. This streamlined calendar literally can host all Delaware progressive events, and will be a great resource for our various groups and the public. Also, we can reduce overlapping events, duplicated efforts, and confusion as to what is happening when. We think this is a true gamechanger for our state. Anyone can view or search for specific types of events or groups, or just explore this calendar to find out all the events that are happening around the state with the click of a button. Delaware United is happy to be of service in this way, and we hope you’re as excited as we are about this wonderful new tool! You can also find it at its direct link here. If you are a large progressive group sponsoring one or more weekly events, contact Delaware United or us through our Contact Page and we will get it on the Calendar. Thanks for posting this, DD! I second Paula’s “Fantastic!” Thanks to Delaware United – you guys are rocking it! NICE! You can add this calendar feed to your Google calendar too…. Brilliant. So helpful. So important to stay clear, organized and focused!